← My secrets to Amazon product pitching! You may have noticed that I haven’t posted a weekly menu that last 2 weeks. Well, that’s because I don’t even know what I’m cooking until that morning or even an hour before dinner. I have been busy getting ready to go back to visit my grandparents (kids’ great grandparents) on the East Coast as well as packing and cleaning in preparation to move 2 days after we get back from Pennsylvania. On top of that, I haven’t known what ingredients I’m going to be given to cook with. Our CSA (community supported agriculture) farm share has started, so we are getting a delivery of fresh organic produce and eggs every Wednesday afternoon. We first heard about the CSA through Fancy’s Kindergarten teacher, who runs Lazy Creek Farm with her husband, and a supposed troll name Stinky Toadwart. We have also been getting a large infusion of food from the Coast Guard families who must go on to their new duty stations, so I have had a very small shopping list the past few weeks and have been cooking all from my pantry, mussgo from departing friends, and fresh CSA produce. 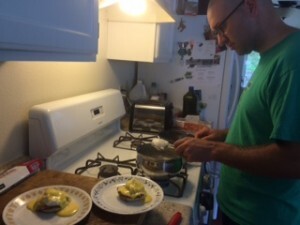 This week we got a dozen farm fresh organic free range eggs that made an AWESOME breakfast of Eggs Benedict. 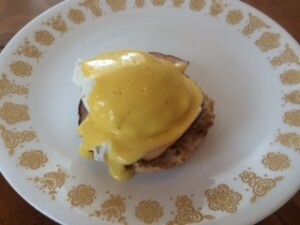 Husband makes the best breakfast on weekends, and these eggs just elevated the dish to a whole new level. Look at that color from the rich yolks! 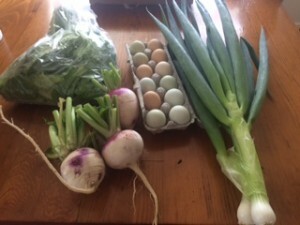 The farm share this week included 3 large turnips, 2 leeks, a large bag of mixed lettuces, and the dozen of eggs for $15. I ended up using 2 of the turnips and one of the leeks to make a turnip, leek, and bacon bake for dinner to go along with a salad made using the greens. The turnip bake had an earthy flavor that I loved, but my kids were expecting potatoes, so they were a little iffy about eating it. But alas, they will try anything with bacon! The salad was an amazing light and fresh accompaniment with the crisp fresh lettuce topped with some dried cranberries and a mango ginger Stilton cheese. I served this up with some lemon and olive oil halibut gifted to us from friends being transferred to Ketchikan, Alaska. Besides the CSA share, I was given literally a wheelbarrow full of food and some frozen rock fish to use. I love getting ingredients I wouldn’t necessarily buy and turning them into something delicious. 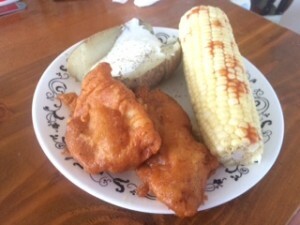 The rock fish was turned into a delicious beer battered crispy fried fillet for dinner. I also received a few cans of marinated quartered artichoke hearts in the wheelbarrow full of food. I used one of the cans that night in a cold tortellini salad with some red peppers, bottled Italian dressing, and a few fresh mushrooms I chopped up and marinated in the drained off brine from the artichokes. The tortellini salad and battered rock fish were huge hits in my house and just goes to show how delicious mussgo dishes can be! During our visit back East, I’m not sure how much I will post. 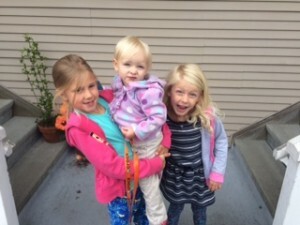 I’m sure we will be doing lots of exciting things that I’ll want to share, but I want to make the most of my time with my kids and family, so the blog might be inundated with posts of our adventures once we get back and all moved into our new house in August. But until then, I have one more week of CSA food that I’ll want to share with you! Fair Winds and Following Seas to all our friends who must go (after one last goodbye picture though)! 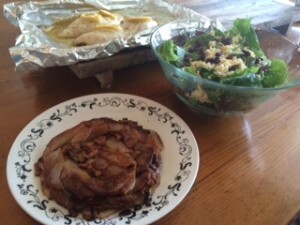 This entry was posted in Coast Guard Life, Cooking and Baking. Bookmark the permalink. 2 Responses to Adventures of cooking with my CSA share! A supposed Troll! Have you not heard of Mr. Stinky Toadwart the infamous star of Coast Radio’s Troll Radio Review? There is nothing supposed about Stinky! I can’t say I have… I don’t have control of what plays while we are in the car and am usually stuck listening to the Lego movie song or Katy Perry. Maybe we will just have to visit the farm to meet Mr. Stinky Toadwart!